Bring your ordinary fried pork chops to the next level. 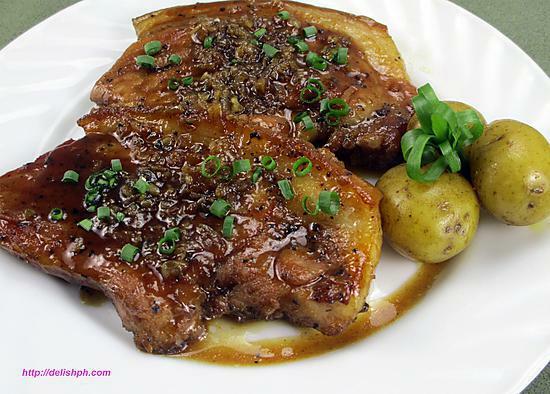 The combination of garlic and brown sugar make a perfect glaze for the pork. 1. In a bowl, combine all the spices. Garlic powder, chili powder, pepper and salt. 2. Rub the spices on the pork chops. 3. Heat pan with olive oil. Fry the pork until brown. Set aside. 4. On the same pan, pour in the broth. 5. Add in the brown sugar and the garlic. 6. Let simmer for 2 minutes before adding the fried pork chops. 7. Cook on both sides of the pork until the caramelized sauce is formed. 8. Put in the serving plate, pour in some sauce at the top and sprinkle with green onions. 74Guest, Guest and 72 others find that it looks really good.